Navy Rings custom made for active sailors and those who have retired. The Navy has been a part of the United States Military since the revolutionary war. It was an essential and integral part of the country’s military power during World War Two. We all feel proud when our fellow countrymen stand tall and courageous in the line of duty. These servicemen in the US Navy sacrifice a lot of their time and lives for the sake of our safety and to make it a better home for us and the next generation. Appreciating them by commemorating their noble and rewarding career with a special gift will not only make them proud but also motivated. The most prized and popular present for navy personnel is the navy ring. Sailors value medals and items associated with their work. Some even keep such items and pass them to their children as mementos. 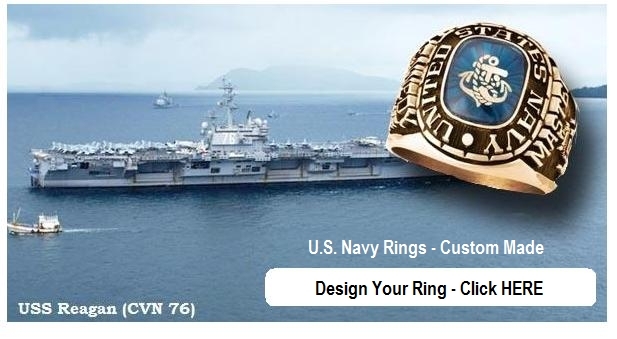 So if you have a friend or someone you know serving in the US Navy it would be such a good idea to present them with a personalized ring. From the attack in Pearl Harbor to the service provided in the South Pacific, the Navy has always been a strong presence in helping keep America free. By defending our seas not only during times of war, but also during times of peace the Navy is a protector. We can never fully repay the sailors in the Navy for their service for their dedication. But we can express our gratitude for their sacrifices in various ways. One of the best ways is to design a custom navy ring with their name and dates of service. Rings are great way to remember their strength of character and dedication. This visual symbol of their commitment is one that the Navy member will certainly cherish for years to come. There are several styles available and each can be personalized specifically for the sailor. You can choose a stone to represent their birthday or rate. The stones can be engraved with a flag or emblem. All rings have a space provided above the emblem for custom text. This can be the sailors name or dates of time spent in the service. For example you could have James Johnson on one side and on the opposite side 1994 – 2014. As a member of the navy, you’re part of a time-honored force that is the first to fight and the first to help. Custom navy rings proudly worn on the hands of sailors convey messages of strength, courage and devotion to our nation. Navy Rings draw the attention from other sailors who will recognize the service and sacrifice. Whether it’s spoken or silent, many will “render honors to port” in gratitude the service and protection. Distinctive insignia emblazoned on your custom navy rings will further reveal the story of the navy adventure without having to utter a single word. 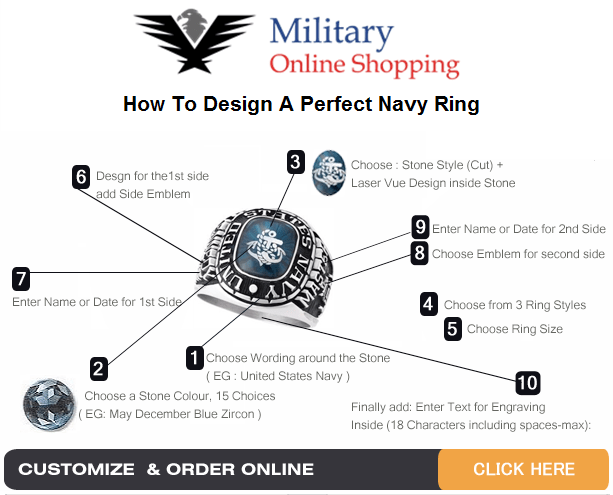 US Navy rings come in various colors, styles and sizes that suit the wearer. Women love miniature sizes that fit them perfectly with their fingers while men prefer large sized rings. You can also choose between different shapes depending on the taste of the person you want to give the gift. Navy rings come in gold, silver or diamond. The material of the ring speaks a lot about the relationship between you and the person you are gifting the ring. A gold Navy ring specifically shows the value of appreciation you hold for their dedication to the service. Since the US Navy has many units, choosing a ring that is commensurate with the type of duty they do is really motivating and will always make them proud. Remember if you want something unique, contact us and we will do our best to fulfil your request.